TheTravelzine Italy 2007 - Cortona. We opted to take the bus from Arezzo to Cortona (70 minutes) because the train arrives in Camucia and a taxi into Cortona would have been required. The bus arrived at Piazzale Garibaldi adjacent to Via Nazionale, the main street to the center of town. If youre arriving by car, follow the signs to Via Nazionale and be on the lookout for the free parking lot with the escalator up to Piazza Garibaldi. None of the other parking lots is free, plus you will have to walk up to the city. We had reservations at Le Gelosie, Via Dardano, 6, just off of Piazza Signorelli, a 10 minute walk from P. Garibaldi. It's a very nice B&B with 4 rooms on 4 floors with no elevator. The owner Andrea will be there and hell help with your luggage. We had reserved for 2 nights, but Andrea informed us we could only stay one night because he had to honor a prior commitment for all four rooms which was to have started the day after we left, but those folks were now arriving a day earlier. Andrea had sort of made arrangements with his friend Massimo who owns Rugapiana Vacanze, Via Nazionale, 63 for us to stay there the second night. I say sort of, because he also suggested another option he was looking into. While he was bobbing and weaving we went across the street for a late pizza lunch that was not a memorable experience. Fortunately the wonderful Gelateria Snoopy in Piazza Signorelli was open and we finally had something to cheer about. Andrea was not successful in securing the other option and Rugapiana it was. We walked down to take a look and were visually satisfied that it would do. We did not want to unpack, repack and move (especially since it was raining) and opted to stay at Rugapiana both nights - big mistake. The heater failed to warm the room, the air and floors were ice cold. There was no hot water in the morning and it was impossible to even think about showering with cold water in a refrigerator! Oh yes, lets not forget the television. Massimo assured us we would have English CNN, SKY, and BBC with the magic box next to the TV set - German or Italian anyone? We called our hotel in Perugia to be sure they could accommodate us one night earlier and left Cortona late in the afternoon of the second day. 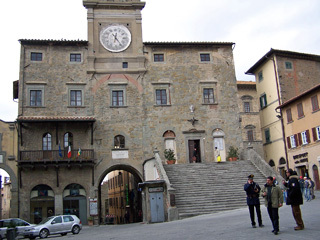 We are not fans of B&B's but all the hotels in Cortona were closed for the winter season, as were many of the restaurants. One of the most popular, Osteria del Teatro, Via Maffei, 2, was open and we were delighted to park ourselves in one of the romantic dining rooms of this historic palace. The owners have maintained the original charming and comfortable design. The house appetizer, a small pot of onion soup with fresh pepper, was very good; if served hotter, it would have been excellent. Primi were wonderful: my strozzapreti al ragu cinta seneseorape (short green and white pasta with a pork and rapini ragu and Lindas fagottini al caprino e pere con pesto al noce (pasta pocket filled with goat cheese and pear with a pesto nut ragu). The house rosso, Sabazio, was light and fruity. Stinco d'agnello and coniglio alla cacciatora con olive were both good mains. The lowlight of the evening was the classless hostess. Unfortunately for us and the other guests in the room she had friends seated here with whom she spent a lot of time talking and laughing, and when she laughed (often) it was a screeching, penetrating sound that was very disturbing to everyone in the room. 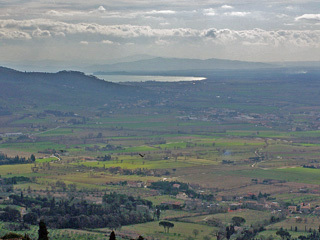 Cortona rises up 360m, near Lake Trasimeno and the Appenines. The scenic views are marvelous and a major reason for its popularity. The Chiese S. Margherita, in front of the remains of the Fortezza Medicea, sits atop the city. It was rebuilt in the new Gothic style in the 20th century. Pilgrims worship S. Margheritas body at the shrine designed by Pietro da Cortona (born Pietro Martini in Cortona). The crucifix, of unknown origin, which she lived with, is to the right of the altar. Five friars live here. Across the way from the ancient Romanesque Cathedral is Museo Diocesano where the beautiful "Annunciazione" by Beato Angelico is displayed. There is a room devoted to Luca Signorelli, the rennaisance painter from Cortona. The frescoed walls and ceiling of the oratory are lovely and there is a nice collection of paintings and mosaics. The Museo dell' Accademia Etrusca was founded in 1727 when Abbot Onofrio Baldelli donated his collection and library to the Accademia Etrusco. 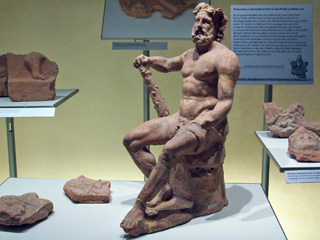 The museum has been enriched with archeological finds from the Cortona area and various donated objects as well as art and handicrafts from a variety of historical periods. The Accademia Etrusca Museum is not a classical museum, it is an archaeological museum, art museum or even civic museum; it is a composite museum, if you will. After the Latin inscriptions on gravestones, funerary urns and statues, Roman and Greek coins, alabaster statues, the famous Musa Polimnia, a painting made on slate with the technique of encausto, there were paintings of Cortona in the Middle Ages. The bronze chandelier, one of the symbols of the institution was accidentally found in 1840 around Cortona and became part of the academic collections two years later. The decorations are complex, gorgeous friezes, busts, an Egyptian collection of funerary objects, paintings, art and craftworks, household goods, jewelry, coins, there's no end. And then there is the library that houses about 10,000 books including philosophy, history, science and archaeology, and Latin and Greek patristics. In 2005 the Museo dell'Accademia Etrusca e della Citta di Cortona was created by the amalgamation of the two, the aim of which was to make a comprehensive presentation of decades of excavations and discoveries through the territory of Cortona using the most modern presentation and museographic standards. We still had time for a late lunch before heading to Perugia. Ristorante il Cacciatore at Via Roma 11/13 was a perfect end to our touring day. We got started with a huge portion of spaghetti with mixed seafood (oodles of shrimp, calamari, mussels and scampi) which was incredibly delicious. Seafood and shellfish rule here so we had mains of grilled gamberi and sea bass. A crisp, clean, fresh chardonnay from Cortona with a lovely finish was a perfect match. The simple environment was cheerful as was the owner and staff. The prices were reasonable for such a well prepared feast.